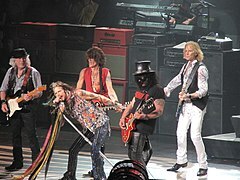 Aerosmith is an American rock band formed in Boston, Massachusetts in 1970. 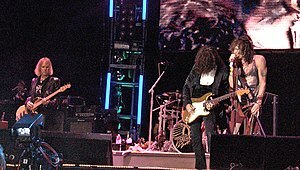 The group consists of Steven Tyler (vocals), Joe Perry (guitar), Tom Hamilton (bass guitar), Joey Kramer (drums), and Brad Whitford (guitar). Their style, which is rooted in blues-based hard rock, has come to also incorporate elements of pop rock, heavy metal, and rhythm and blues, and has inspired many subsequent rock artists. They are sometimes referred to as "the Bad Boys from Boston" and "America's Greatest Rock and Roll Band". This page was last edited on 18 April 2019, at 21:04 (UTC).